Orgran gluten free Easy Bake Bread Mix is a convenient versatile mix. Just add liquid and fresh bake in a conventional oven or bread making machine. 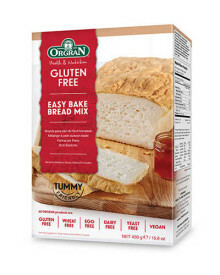 Orgran bread mix is very unique as it does not contain dairy products or cane sugar and you do not need to use eggs to produce a full crusty loaf that you can slice, freeze, toast and enjoy the same way as ordinary wheat based bread.